It’s not often (or ever) that I get invited to two ground-breaking events in one day. But on Wednesday I found myself at 250 Columbine in Cherry Creek North where representatives from Western Development Group (headed by Phil’s son Christian Anschutz) and Denver dignitaries followed by a preview party for Washington Park Station, which recently broke ground at Louisiana Avenue and Washington Street adjacent to the light-rail station. The two construction projects are very different: 250 Columbine is a mixed-use development with retail, residential and office spaces, and Washington Park Station is a five-story apartment building from Zakhem brothers John and Mike along with former hockey super turned star investor Peter Forsberg and Taco Bell franchisee Rob Alvarado. Both projects, however, indicate a healthy economic recovery for Denver’s commercial real estate sector. 250 Columbine will encompass an 80,000-square-foot office building (ready for tenant improvements in the late fourth quarter of 2014), 70 condominium residences (ready for occupation late first quarter of 2015) and roughly 30,000 square feet of retail space all over two levels of underground parking. Denver-based PCL Construction is the general contractor for the project, and OZ Architecture, also of Denver, is the architect. Denver Mayor Michael Hancock waxed nostalgic about his formative years spent late-night at Village Inn, which has been reduced to a pile of scrap metal. David Steel, a partner in Western Development, took advantage of the mayor’s and four city council members’ presence to plead his case for angled parking along that block, which has yet to gain Council approval. “It’s very cagey to invite the mayor and four City Council people then announce you need city approval for angled parking,” teased Jeanne Robb, City Councilwoman whose District 10 includes Cherry Creek North. Across town at Hanson’s Grill & Tavern in the South Pearl neighborhood, Zakhem and Zakhem, brothers and business partners, hosted a celebration of the start of construction on the five-story 32-unit apartment building with 2,800 square feet of retail space. The brothers bought the land six years ago, but more recently acquired the key corner spot that completed the plot. For more information on 250 Columbine visit www.250columbine.com; for Washington Park Station, call 303-532-5511. Denver-based Curious Cork, importer of Tuscan Sun Wines, is bringing in bestselling author, cook and designer Frances Mayes for an evening that includes a four-course dinner and wine tasting beginning at 5:30 p.m. Sept. 11 at Pizza Republica in the Colorado Convention Center, 890 14th St.
Mayes, author of the romantic “Under the Tuscan Sun” and “Bella Tuscany” draws on her long connection to Cortona, Italy, in Tuscany and her friendships with noted winemakers throughout the country. Guests will enjoy the dinner paired with the six Tuscan Sun blends, and get to meet Mayes. The evening begins with cocktails, bruschetta, pizza and misto bars. The four-course dinner features poached pear salad; pesto, porcini and parmesan pasta; osso bucco with herb polenta, olive oil poached tomato, Milanese sauce and rosemary and cantucci with vin santo semi fredo or ice cream with spun sugar. The Tattered Cover Book Store will be on hand to sell all of Mayes’ books including her recent cookbook “The Tuscan Sun Cookbook.” Mayes will also be signing books. Tickets for the event are $110, and can be purchased at https://www.blacktie-colorado.com. The fourth edition of Penny Parker Presents The Fourth Evening of Decadent Delights on Sept. 30 will take your taste buds on a culinary adventure while supporting Sense of Security, the Colorado nonprofit that covers non medical expenses for breast cancer patients (www.senseofsecurity.org). The enchanting evening begins at 6 p.m. at Balistreri Vineyards (66th and Washington) with a cocktail party sponsored by Downslope Distilling followed by a multi-course dinner at 7. Some of Denver’s finest chefs who will blow your culinary mind are: Troy Guard (TAG, TAG Raw Bar, TAG Burger Bar), Tyler Wiard (culinary director for Elway’s restaurants), Michael Bortz (City Bakery), Alex Seidel (Fruition), Brian Laird (Sarto’s), Sean Yontz (formerly with El Diablo) and Lance Barto (The Social). Robert Eldridge is back for the fourth year performing acoustic guitar during dinner. Emcee Les Shapiro is sure to get the party rolling and pump up the live auction. Tickets are limited and available at www.blacktie-colorado.com. Enter event code SOS930. Our friends at Uber are providing $40 off one ride for new users. To claim your discounted ride, sign up for an Uber account by downloading the app to your iPhone or Android and enter the code DDELIGHTS under “promotions” or sign up at www.uber.com/go/ddelights. For more information, contact event manager Trisha Lindeman at 720-985-6947 or at trilind@hotmail.com. The summer dining season of the Highland’s Garden Café, 3297 W. 32nd Ave., will close on Saturday following the restaurant’s traditional seasonal schedule. The Café will reopen in April for guests to enjoy the spring tulips forsythia, lilacs and roses that have drawn diners to Highland’s Garden Café for nearly two decades. If you’d like to be added to the mailing list, contact Perry at patperrychef@comcast.net. Do you know folks who aren’t subscribing to my Blacktie-Colorado column? Say what? How ’bout if we give them some incentive to sign up. On Wednesday, one lucky subscriber will win two VIP tickets to Denver Food and Wine, the most fun you can have under a tent, from 11 a.m. (VIPs get early admission) till 4 p.m. Sept. 7 on the grounds of the Metropolitan State University of Denver campus. Here’s the catch: To be eligible to win the tickets, you MUST be a subscriber. On Wednesday, Blacktie’s accounting firm of PricewaterhouseCooper (see, just like the Academy Awards … hee hee), will draw the name of the winner, who will be notified and announced in my Sept. 6 column. To subscribe, go to www.blacktie-colorado.com/pennyparker. Click on my icon, then click on “subscribe.” VIPs at Denver Food and Wine get a respite from the heat with umbrella-clad tables, fancy fare from The Brown Palace and fine wines in a private area. Ticket value: $250. Actor Kurt Russell and a group taste-testing his GoGi wine line at Elway’s Cherry Creek on Wednesday. He’s named the Chardonnay “Goldie” after forever girlfriend Goldie Hawn. The Viognier is called LuLu after his mom. And the Pinot Noir is called Bosty Boy in honor or his son, Boston. Read more about GoGi wines at https://www.facebook.com/pages/Kurt-Russell-Wines-Gogi/202104946484539. Meanwhile in downtown Denver, former Doobie Brother Michael McDonald, in town Wednesday for a Denver Botanic Gardens concert with local vocal Hazel Miller, was spotted sipping cocktails in the bar at Panzano inside the Hotel Monaco. 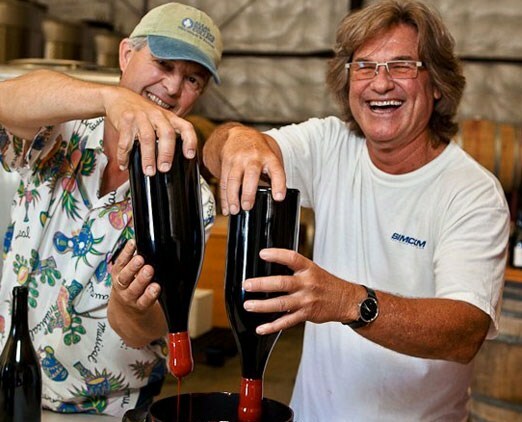 Kurt Russell dips the signature wax to one of the bottles of his GoGi wines, a Pinot Noir, Bosty Boy named after his son, Boston. The wine’s name, Gogi, is Russell’s nickname.